Rome (VNA) – Gender equality, prevention of child and female labour abuse and human trafficking, and the role of women are areas for parliamentary cooperation between Vietnam and Italy in 2017 as proposed by NA Vice Chairwoman Tong Thi Phong. During her talks with Vice President of the Italian Senate Valeria Fedeli in Rome on May 26, Phong affirmed that the regular exchange of high-ranking delegations and the signing of numerous bilateral agreements have reflected the positive development of the Vietnam-Italy strategic partnership, especially in politics and economics. She expressed her hope that the two sides will consider boosting collaboration in education and vocational training and culture, and sharing experience in joining the United Nations’ peacekeeping missions. 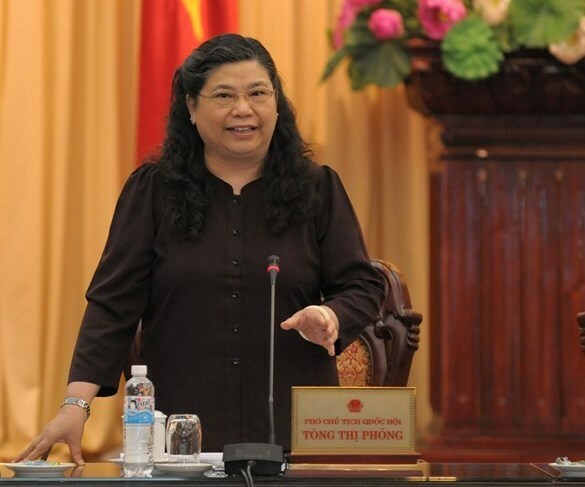 Valeria Fedeli hailed Vietnam’s role and its contributions in the regional and international arenas, and conveyed her congratulations to Nguyen Thi Kim Ngan, who was recently elected as the first NA Chairwoman of Vietnam. Earlier, the Vietnamese legislator had a meeting with Marina Sereni, Vice President of the Chamber of Deputies of the Italian Parliament, where they discussed measures to boost bilateral cooperation in economics, trade, culture and tourism. They also exchanged notes on the regional and global situations in the face of challenges like terrorism and financial crisis, agreeing that the role of international organisations should be promoted, and big countries need to respect international law and principles as well as peaceful dialogue and negotiation mechanisms. Praising the role of Italy in Asia-Europe dialogue mechanisms, Phong confirmed Vietnam’s support for Italy’s candidacy as a non-permanent member of the UN Security Council in the 2017-2018 tenure. The NA Vice Chairwoman also had a working session with Pier Ferdinando Casini, Chairperson of the Senate Committee on Foreign Affairs and Chairperson of the Italy-Vietnam Friendship Parliamentarians’ Group, who affirmed that in any position, he will support Vietnam’s national construction and safeguarding. He suggested the two countries intensify cooperation in trade, investment, tourism and education and training, on the basis of agreements Vietnam signed with the EU like the Partnership and Cooperation Agreement and the Free Trade Agreement. He emphasised that Italy always keeps a close watch on developments of sovereignty-related disputes in the East Sea and backs Vietnam’s stance of addressing the disputes by peaceful means, not complicating the situation, and ensuring maritime freedom and security for all nations. Phong again confirmed that Vietnam attaches importance to its friendship and cooperation with Italy, and is willing to support the country at international forums, and help it develop relations with ASEAN.